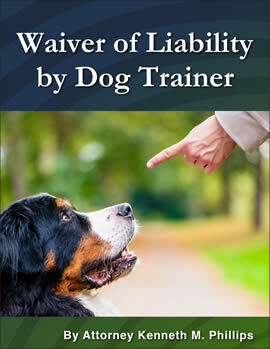 Eliminate the risk of a lawsuit when a dangerous dog is being trained. Gives peace of mind to a dog owner who wants to give his dog a second chance without the risk of getting sued by the trainer. A dog that bit a person might not have a vicious temperament. With the right trainer, the dog might be rehabilitated. If the dog injures the trainer before its aggression is eliminated, however, the dog owner might find himself facing a large claim for compensation. This Waiver of Liability by a Dog Trainer prevents this from happening by confirming that the trainer knows the dog can bite, that the dog owner has not misrepresented the dog as being safe, and that the trainer assumes the risk of getting injured.